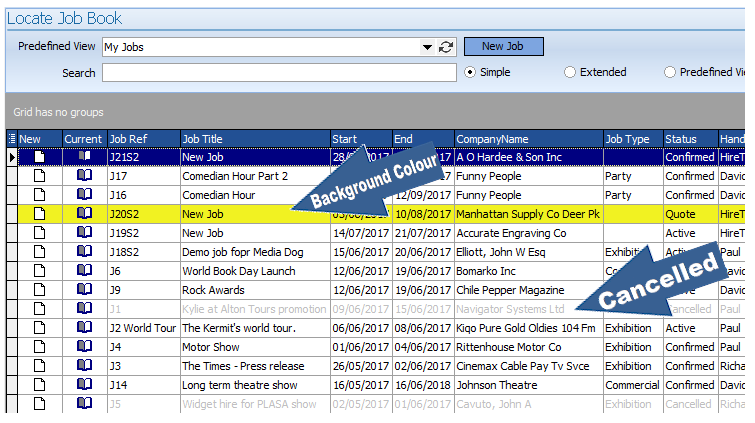 HireTrack NX Search Grid results can now be dynamically coloured based on your data. This feature won our Navigator award for the most requested HireTrack NX feature by our existing customers at PLASA 2017 and has been included in HireTrack NX version 3.1.253 which was released on 9 October 2017. The search form already allows the user to create any number of views of their data, but now colour can be added to help distinguish quickly and easily differences in the displayed data, for example, between the status of each job. The user can decide on their own colour scheme specific to their needs and can set this up accordingly. Data can already be sorted by simply clicking the column header but by adding a colour, dependent on the data, the list becomes even easier to read. If you are an existing HireTrack NX user, then this Knowledge Based Article will give you further information and a worked example.